Explore Boston's cinematic side with this self-guided tour of the best Boston movie sites! From The Town to Mystic River to Good Will Hunting, your private driver will cruise through the city in a premier Rolls Royce Ghost to see all of the best spots from the big screen. With this private, self-guided tour you'll enjoy the luxury of your own personal driver, itinerary, and fabulous Rolls Royce Ghost! Cruise along to the best-known movie and TV sites as you dictate how much time you'd like to spend at each. Start your 3-hour tour with pickup at your hotel or local accommodations, and set out to explore the city with your guide. You'll visit Charlestown to explore the setting of The Town. Ben Affleck brought the historic neighborhood to the big screen with bank robberies, gangsters, and FBI manhunts, but the neighborhood is also full of rich history, culture, and monuments. Visit the North End of Boston to see filming sites of various movies including National Treasure and The Town, and check out the neighborhood of Jimmy Fallon's character, Ben, in Fever Pitch. Continue on to the nearby West End of Boston, where you can see the mental health facility that was filmed as the police headquarters in The Departed. Continue on to the Irish-American neighborhood of South Boston, or 'Southie' as the locals know. Film executives often turn to the authenticity of South Boston when scouting for Irish-American movies such as The Town, Southie, The Verdict, Mystic River, The Departed, and Gone Baby Gone. You'll also see the L Street Tavern, used as Matt Damon and Ben Affleck's hometown pub in Good Will Hunting. Keep up the fun with a cruise to the South Boston waterfront and Seaport area, home to the Boston Convention Center as seen in 21. Other films shot in the neighborhood include The Game Plan and Next Stop Wonderland. Swing by the Moakley Courthouse to see the site of notorious mobster James 'Whitey Bulger's arraignment, the real-life inspiration behind Jack Nicholson's character in The Departed. 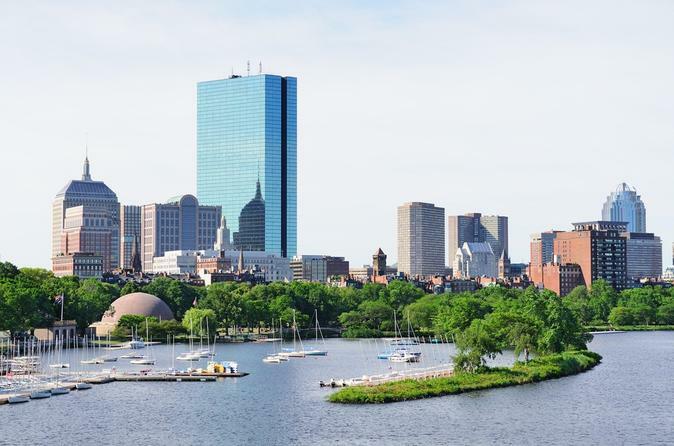 Your tour will also explore Beacon Hill and downtown Boston to visit sites around the neighborhood and the popular Boston Common and Boston Public Garden. You may recognize the area from such movies and TV shows as Cheers, Ted, Ally McBeal, Boondock Saints, MTV's Real World, and Good Will Hunting. Conclude your tour with drop-off at your hotel or local accommodations and a wealth of new Boston movie trivia!